Don’t you hate it when you want to prepare a meal but your favorite knife is nowhere to be found? I know that I do. I used to put all my knives in the drawer and when I need my chef knife it takes me ages to find it because sometimes my hubby puts it in the second drawer with stirring spoon and ladle even though I tell him all the time that the knives go in the first drawer. But I guess that he just doesn’t listen. But the one thing that really scares me is that my kids can easily open that drawer and take out the knives because they are at that age when they want to touch everything that is new and exciting. That’s why I needed something that will store knives properly and look good in my kitchen without taking too much space and I can gladly say that I have found it. I present to you... a knife block! How To Properly Choose A Good Knife Block? There are three ways that you can store knives: in the drawer, on the wall or in a knife block on the counter. If you have extra space, you can put a magnetic knife strip on the wall above your counter to store your knives. Good thing is that it’s practical because all of your knives are there so you don't have the trouble with searching them unlike when you put them in the drawer. But, in order to store things on the wall, you'll need to have a magnetic knife strip that has a strong magnet but not too strong, because if the magnet is too strong its force will snap the knife on the strip too hard and it could chip it. If you have some extra space on the counter than storing knives in the knife block may be the best solution. A knife block is a kitchen utensil that is designed to safely store knives vertically, at angle, or sideways. It comes in different shapes and sizes and it’s mostly made from wood, steel or other materials. Using a knife block keeps knives close at hand and easier to find and it looks good in your kitchen. Storing knives in the knife block is a much safer way than keeping them in the drawer and it also extends the lifespan of the knives as well. Choosing a knife block depends on many things. Before you choose your knife block it’s important that you determine what kind of knives you have in your kitchen in order to properly choose your knife block. There is a wide range of kitchen knives but the most common knives that can be found in a knife block set is a chef knife, a bread knife, a carving knife, a utility knife, a boning knife, a steak knife and a paring knife. A chef knife is a cutting utensil for food preparation. This is the most common knife type and it can be used for slicing, cutting and chopping vegetables or meat. It generally has a blade of 8 inches in length, but it can come in various sizes usually from 6 to 14 inches. A bread knife is a serrated knife, made that way that it gives perfectly shaped slices of bread without crushing it. Bread knives are usually between 6 and 10 inches in length. A carving knife is a large knife that is used for cutting thin and precise slices of meat. It's much thinner than a chef knife which enables it to cut thinner slices of meat than any other knife can. The average size of a carving knife is between 8 and 15 inches. A utility knife's size is somewhere between chef's knife and paring knife usually from 4 to 7 inches. It's good for small jobs in the kitchen like cutting vegetables, fruits, and meat for sandwiches. A steak knife is a sharp knife with a plain cutting edge but they can be also found with a serrated cutting edge. The average size of the steak knife is between 8 and 9 inches. A paring knife is a small knife with the plain cutting edge that is mostly used for peeling and other small work such as removing seeds from vegetables or cutting garnishes. The paring knife is usually between 2 and 4 inches long. Knife blocks are usually sold with only a base that has a lot of slots in different sizes for different types of knives but they can be also found with knives included too. There are three common materials that are used for knife blocks: plastic, wood, and steel. Plastic knife blocks are commonly used, but they are not very durable because they can't hold too many knives. Wooden knife blocks are good for knives that are prone to corrosion and rust because wood helps to remove excess water from the metal surface. But the flaw is that you have to clean it more often because wet wood can become home for many kinds of bacteria. Blocks that are made from stainless steel are easier to maintain, but like the plastic ones, they also can't hold too many knives in their slots. Before you purchase your knife block it’s important that you determine what knives you will keep in the knife block. Knives come in different shapes and sizes, so it is important that you measure your knives and then go and search for a proper kitchen knife block that will be able to fit them all. Unlike other more important things, aesthetics isn't that big of a deal for purchasing knife block but it still is kinda important. Your knife block is on the counter on display all the time so it has to fit the overall design of your kitchen in order to look more appealing. Now that I have told you everything that you need to know about kitchen blocks and how to choose them properly, I give you my 5 favorite knife blocks with the detailed reviews from my experience. Remeber the three ways of knife storing that I mentioned earlier? What If I tell you that you can store knives in a knife block and in the drawer at the same time? Well, you can because this is an in-drawer knife block that can store 10-15 knives, depending on the size of the blade. It can fit in a standard drawer approximately 3 inches depth. Unlike other knife blocks, Shenzhen 's has an improved design with a wider opening that has angled slots, which allows you better knife storage. Other than that, it also has a few deeper slots that provide a better fit for larger knives. I personally have a lot of knives with different shapes and sizes and every one of them can fit smoothly in the knife block. 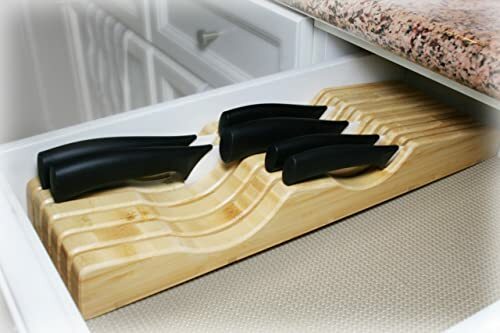 This knife block is a great way to store your knives If you don't have much counter space. Also, it keeps your knives organized and there are no blades sticking out from the drawer. The greatest thing about this knife block is that it's made from eco-friendly and bacteria resistant bamboo, like most of Shenzhen products. 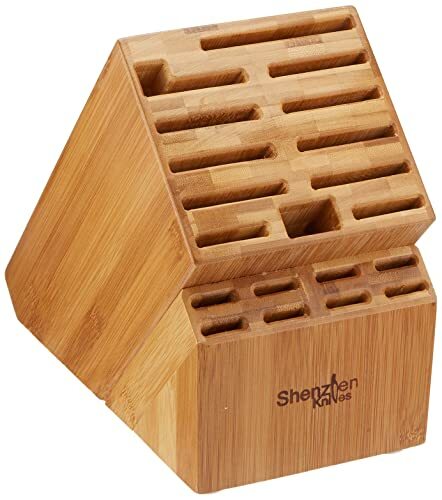 This is another knife block from Shenzhen that is made from bamboo veneer and wood core. Just like the previous product, this one also has wider slots that allow you to store knives which have larger blades and it can store up to 19 knives including scissors and sharpening rod. A new and improved design has angled slots that help you to handle and store your knives without any trouble. Other than that, it has a horizontal slot layout that puts less wear on the knife blade when it's being stored. If you have some extra counter space than I personally suggest that you store your knives in this knife block. Other than the function that it has, it also has a great design and it can easily fit with the rest of your kitchen gadgets. This is an innovative Swiss designed glass knife block that stores knives and makes them visible and easy to find. It can store up to 18 knives with different shapes and sizes up to 8 inches long. The knives are easily placed and even easier removed. Unlike traditional wooden knife blocks, this one doesn't take too much space on the counter because it is slim and well-balanced. Because of the innovative design, it goes great with the rest of your kitchen gadgets. It's really easy to clean, you just need to take out the plastic top, run it through the dishwasher and then dry it. Here's a little tip: If the kitchen block is too see-through you can decorate it with fake flower petals that will brighten up the kitchen counter a little bit. The Boker magnetic knife block is an innovative way to store your knives by making them visible all the time. This knife block has seven wooden panels that contain magnets which allow knives to stick easily to the side of the knife block. This innovative and high-quality designed wooden knife block can easily store up to 7 high-quality knives. 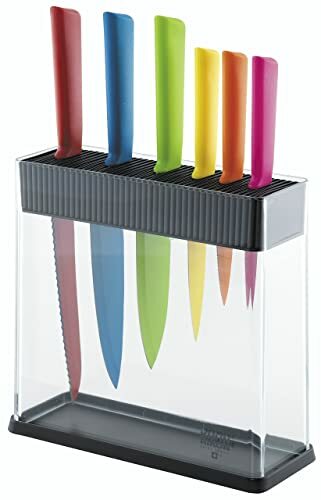 The great thing about this product is that it has no slots which allow you to display your knives on the block by making them visible all the time on the counter. Every side of the block has strong magnets that keep your knives safe. Even though the magnets are strong, you can still take out the knife that you need without worrying that you will chip it. Unlike other kitchen blocks that have slots that are hard to reach, with this one there is no trouble with cleaning. It comes in three different colors which give you the opportunity to fit easier with other kitchen elements. The Premio stainless steel knife block is made from a special blend of materials that give strength and better stability to the knives. The exterior of this knife block has a modern design that will blend in well with your kitchen design whether it is modern, rustic or timeless and classic. It has unique dual layer wave-slot design which allows knives to easily slide in and out without any abrasion from the sides which makes this knife block different from other knife blocks I've considered today. 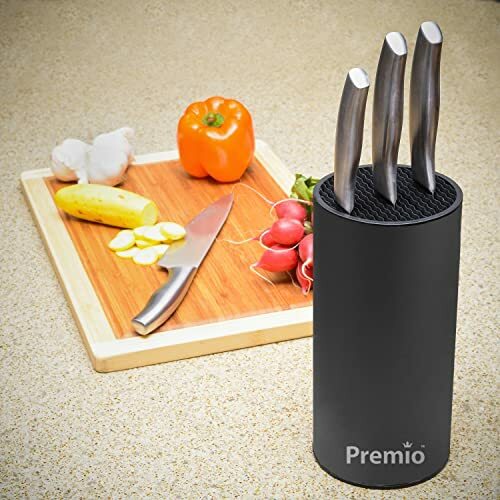 Another great thing about Premio's stainless steel kitchen block is that it can easily fit up to 12 knives with different shapes and sizes because it has weighted bottom that is designed not to be prone to falling over. Also, it is easy to clean, all you have to do is to run it under the water and you're set to go. I think that we can agree that wooden knife block is the best choice for your kitchen. Sure, It has to be washed and cleaned all the time but unlike other materials, it stays still when you fill out all the slots with knives. 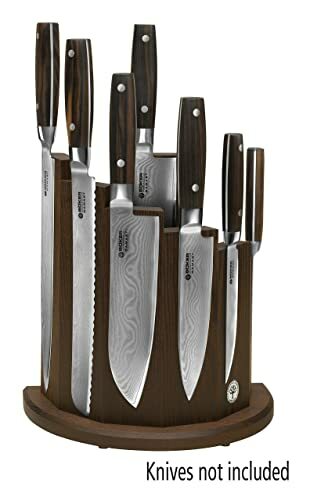 The Boker Magnetic Knife block has a great design and a good way of displaying your knives but it can hold only 7 knives which I think is not enough. So, by my opinion I think that the best choice for the kitchen block is Shenzhen Universal Knife Block because it is made from great materials, it stays still when it is filled with knives and it looks good on your kitchen counter.